UPDATE: As expected, Apple announced a couple of new iPads during the WWDC opening keynote. Here you can meet the new 10.5-inch and 12.9-inch iPad Pro models. Few are the instances when the unavailability of a service could be seen as a reason for excitement. 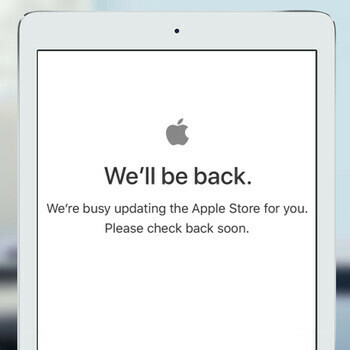 The Apple Store going down is one of them. The reason? In most cases, that's a solid indication that new hardware is about to be introduced. Is it a coincidence that WWDC 2017 kicks off in less than an hour? Most certainly not! Rumor has it that Apple has new hardware to announce at the show, and the opening keynote would be the perfect time for the unveiling to be made. Chances are that we'll witness the announcement of two new iPad models, along with a range accessories made for them. One of the two is believed to be a new, 10.5-inch iPad Pro, while the other could be a successor to the 12.9-inch iPad Pro model from 2015. Naturally, both are expected to bring cutting-edge hardware, including last-generation displays and a faster system chip. You can join the fun by following Apple's WWDC launch keynote or our own liveblog, and in the minutes until the show's start, you still have time to catch up on the latest rumors. Links are provided below for your convenience. Jun 02, 2017, 6:42 AM, by Kaloyan C.